Singapore Noodles is a popular Asian dish made with thin, curried rice noodles and vegetables. Contrary to its name, Singapore Noodles is not a dish generally eaten in Singapore, but it is very popular in Hong Kong, Australia, Canada, the UK, and the US. Curry powder gives the noodles a yellow hue. The recipe below includes shrimp, but you may substitute other meats or prepare the dish vegetarian. 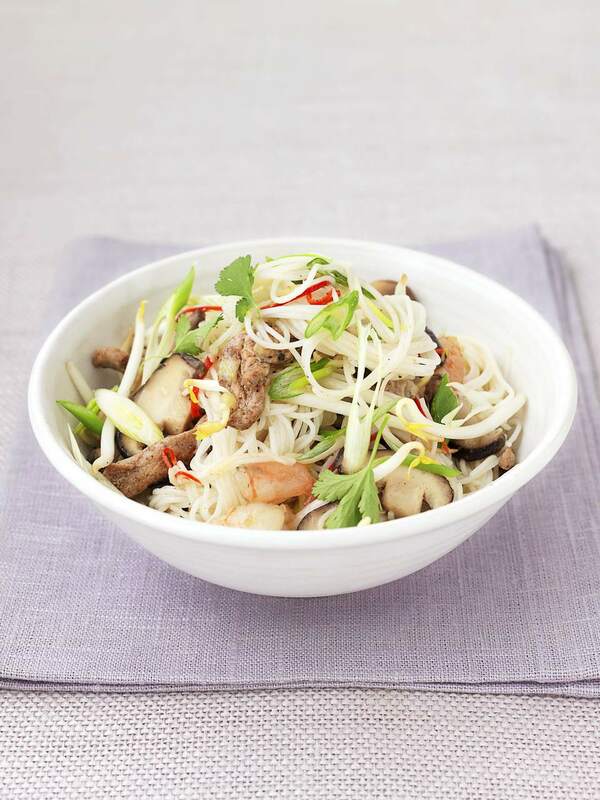 Soak the rice noodles in warm water for 15–20 minutes, or until they have softened. Drain the noodles in a colander. Prepare the remainder of the ingredients while the noodles are soaking. Shell and devein the shrimp if needed. Soak the shrimp in warm salted water for 5 minutes. Drain thoroughly. Prepare the sauce by whisking together the water or chicken broth with the brown sugar,salt, and pepper. Set aside. Heat the wok over medium-high to high heat. Add 2 tablespoons oil. When the oil is hot, add the shrimp. Stir-fry the shrimp until they turn pink. Remove from the wok. Heat 2 tablespoons oil in the wok. When the oil is hot, add the curry powder. Stir-fry for about 30 seconds, then add the ginger and stir-fry until the ginger is aromatic. Stir-fry the vegetables, beginning with the carrot. Then add the red bell pepper and Napa cabbage. Stir in the bean sprouts. Stir-fry for about 20 seconds, and then add the shrimp back into the pan with the noodles. Stir in the green onions. Pour the sauce over the ingredients in the wok and toss so the sauce is absorbed. Add a bit more water or chicken broth if the mixture becomes too dry. Taste and adjust the seasoning, adding more sugar, salt, pepper, or curry powder as desired. Cook until the sauce is absorbed. Serve hot.